← Forests Update: Big Yearly Wildfire Losses, and More! The Harm of Denying Climate Change, and More! 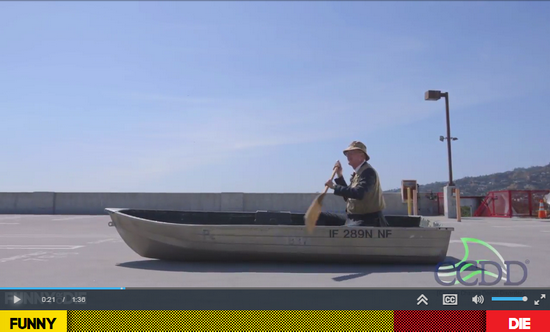 @@ Funny or Die: Climate Change Denial Disorder – absolutely hilarious. Enjoy, and share! @@ How Much Fossil Fuel Is Extracted As You Read This? Click n See: The Rate Is Staggering. Check out this interactive on coal, oil and gas extraction. 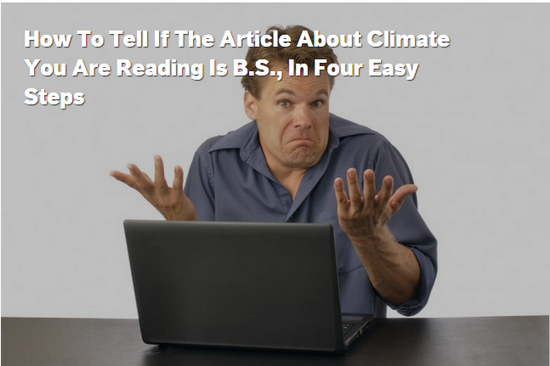 OO How To Tell If An Article About Climate Is BS? – indicate the problem is hopeless or unsolvable: it isn’t. – are written by authors clueless on the subject; wiki them and their connections, if unsure. – do not discuss specifically how to bring down emissions drmaatically. 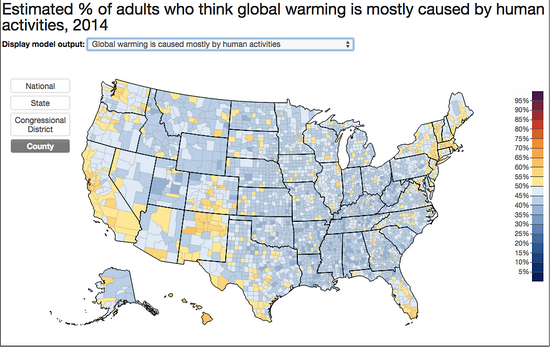 Most US adults accept climate change exists – but most do not understand that it is manmade. Yale Project on Climate Change Communication. @@ Mapping US Climate Change Denial, County By County: A Valuable Portrait – Yale Climate Opinions maps http://environment.yale.edu/poe/v2014/ are a new tool from the Yale Project on Climate Change Communication. This site provides estimates of U.S. climate change beliefs, risk perceptions, and policy preferences at the state and local levels – a new source of high-resolution data on public opinion that can inform national, state and local decision-making, policy, and education initiatives. OO What Will Happen After People Stop Ignoring Climate Change? We’ll debate policy – and it’ll be a lot more productive. OO Taking Action On Climate:The Ultimate No-Regrets Business Strategy– How much will a company – and all of us – regret not taking action if the outcomes are much worse? Given the day-to-day benefits of moving to a clean economy, corporate action on climate is the ultimate no-brainer. The Answer Is Blowing in the Wind – the Pacific trade winds, that is. A cycle of strong trade winds has forced heat into the oceans, slowing land heating, and help set up the atmospheric ridges that are blocking storms from California, new research shows, reports Brian Kahn at Climate Central. OO A Weird Warm Pacific ‘Blob’ May Be Fueling California’s Drought – sounds like a 1950s horror movie monster, but it’s a real-life ocean anomaly that kills seals, causes drought and is related to the East’s terrible winter. 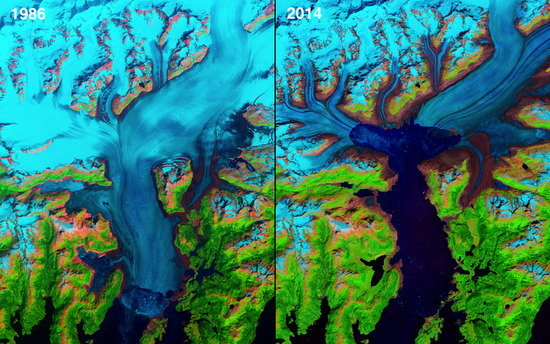 OO 15 Before-And-After Images That Show How We’re Transforming The Planet – from the NASA “Images of Change” series – intense and sobering. Our children will die inhumanely. 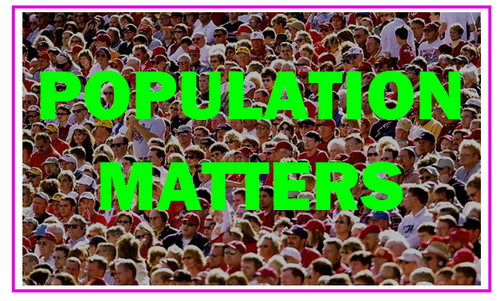 OO Iran: New Law to Increase Population Will Cost It Big Time – in unwanted pregnancies (already at 30% nationally), increased health costs, spread of sexual diseases, and increased unemployment and poverty, note Iranian medical experts. Support and elect politicians who are sensitive to issues of reproductive choice here in the U.S. and abroad. And there are many more actions you can do, right here. This entry was posted in Uncategorized and tagged climate change, climate change denial, climate denial, denial, economics, health, no regrets, population, rainforest. Bookmark the permalink.